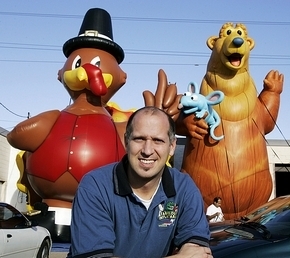 Patrick Missud, owner of Entertainment Express, a limousine service on Telegraph Road in Dearborn Heights, said the inflatables draw eyeballs and foot traffic. Missud recently took down a Halloween display of dancing ghost balloons and will soon put up Christmas-themed inflatables. Generally more than 20 feet tall, the dancing inflatables are made of lightweight material and powered by a fan attached to the base. The balloons, which come in an array of characters and colors, twist and bend as the wind flows through them. Dancing inflatables can weigh two or three pounds, compared to more than 100 for a static “rooftop” balloon. And they cost “half or even less than newspapers, radio commercials or static balloons,” Austin said. So far, inquiries to SkyDancers have increased between 30 and 40 percent over last year’s holiday season, Austin said. One of SkyDancers’ most popular balloons — a 25- to 35-foot tube resembling a candy cane — costs $700 to buy or $100 per day to rent. In comparison, a static gorilla-shaped balloon favored by car dealerships can cost between $4,000 and $8,000 to purchase or $1,500 per week to rent. Dynamic Displays in Windsor supplies dancing inflatables to Metro Detroit businesses including gas stations, coney islands and Tim Horton’s restaurants. His clients report that foot traffic increases between 15 percent and 50 percent when they add a balloon to their property. The balloons are especially suited to businesses near high-traffic areas because their height often makes them visible from highways, he said. As with most forms of advertising, Stoltman said, the psychological impact of a dancing balloon takes only a couple of seconds for a passerby to acknowledge and process. “They’re all intended to do the same thing — to break into people’s routines and divert their attention to this unusual thing and then decide whether to investigate,” he said. You can reach Jaclyn Trop at (313) 222-2300 or jtrop@detnews.com.